We’ve been Pyrex fans since we were kids. Mom loved all the colors and patterns. And Dad loved that he could bake, serve, and store his lasagna all in the same dish! 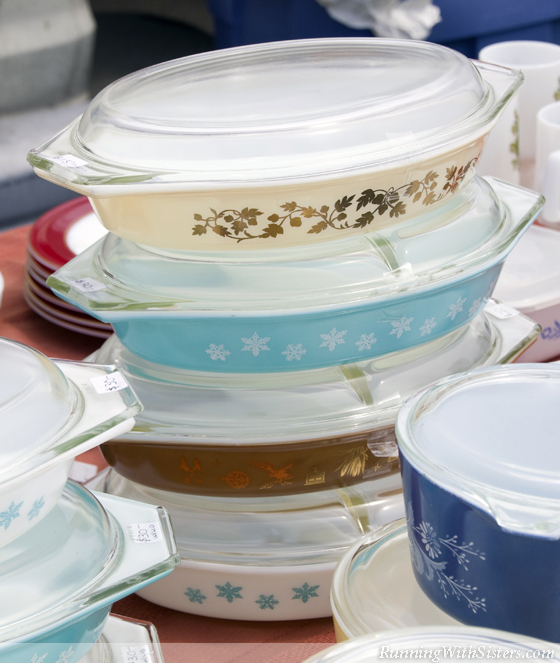 We love that Pyrex is a collection we can use every day, and that means it’s always okay to go shopping for Pyrex! Jennifer especially loved a turquoise divided dish with white snowflakes. We each picked out a piece. Kitty’s small orange casserole with a flower and bird design on top was $22 and Jennifer’s snowy blue casserole was $25. The seller pointed to each one and said “Friendship” and “Snowflake.” What fun! We wandered into a booth that had a table stacked high with Pyrex pieces. 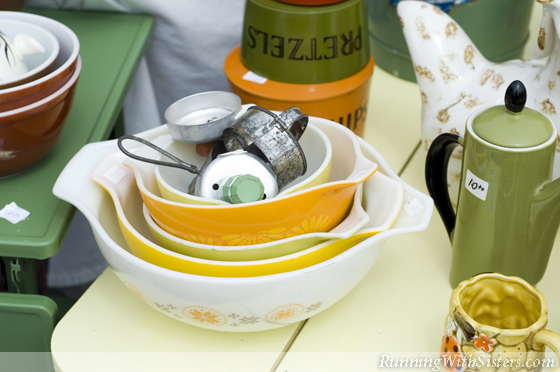 There were oval casseroles, mixing bowls, loaf pans, and more. Kitty picked up a small pink refrigerator container with printed leaves and checked it for chips or cracks. Jennifer identified the pattern as “Gooseberry,” which we just learned from the previous vendor! We thought the color looked crisp, like it had never gone through the dishwasher (a great tip we got from a fellow collector!). It didn’t have a lid, but the $10 price wasn’t bad since it was in such good shape. 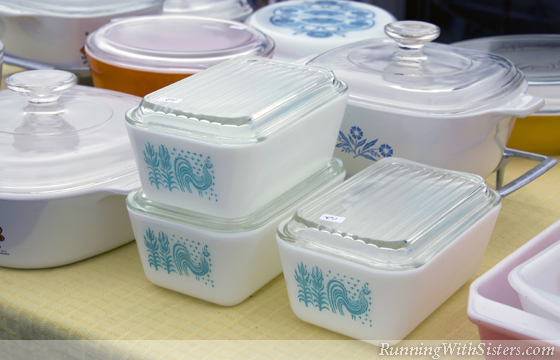 Plus, we see Pyrex lids at thrift stores all the time, so we can just keep an eye out for one that fits. 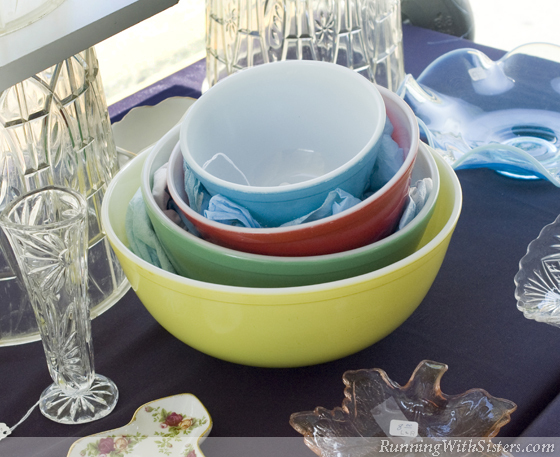 Collecting Pyrex is an ongoing quest, after all! We found more kitchen things on a table at the end of the aisle, and we both went straight for the mug tree. 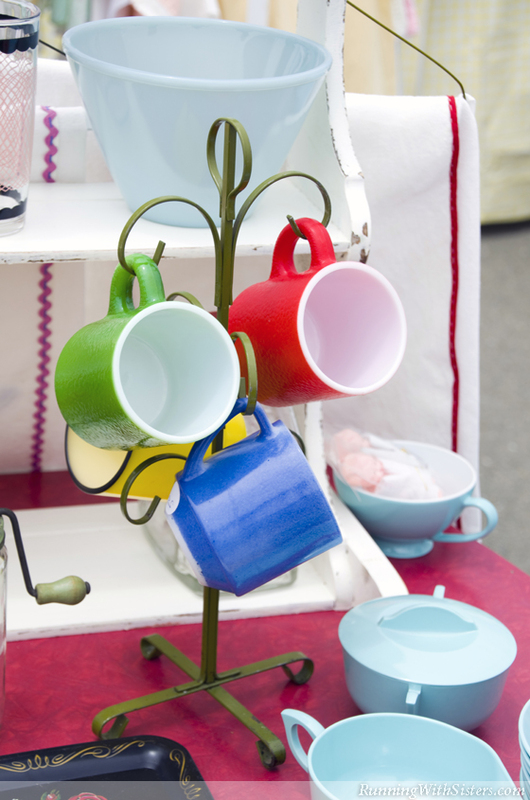 It had four coffee cups in red, yellow, green, and blue. It was just like one we had in our kitchen as kids. We asked if the cups were Pyrex, and the gal said no. She turned one over, and it was embossed with “FireKing.” She said Pyrex had a lot of competitors including Glasbake and FireKing that all made heat resistant glass cookware. We knew the names, but weren’t sure if they were Pyrex or not. 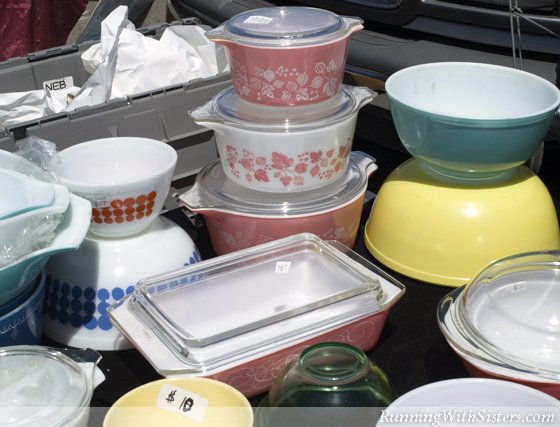 She said they all made cute stuff, but Pyrex is probably the most famous and collectible. 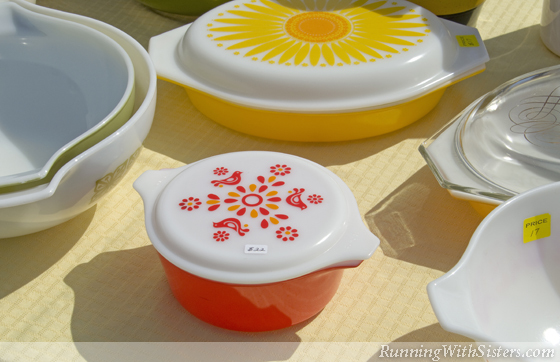 We decided it would be fun to look for more of these other brands, but for today, it was Pyrex all the way!